The Green Scene in Northridge, CA. 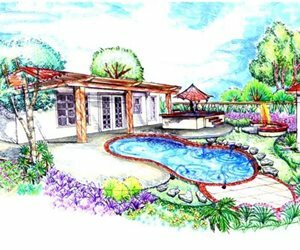 As one of the largest components of your backyard area, the swimming pool requires a lot of thought and planning in determining where to put it. It must accommodate a deck, surrounding landscaping, and adjoining patios. It's helpful to imagine your backyard space as activity zones. Your activity zones might include an outdoor kitchen area, a children's play area, a grassy lawn, the pool deck, planting areas and trees, etc. Each of these activity zones must work in harmony with where you place the pool. There are also restrictions that can limit where a pool can be located. Zoning regulations, slope and drainage elements can influence the location and shape of your pool. You'll need to check with your city or county zoning office to find out restrictions. In some areas, pools must be 15-25 feet away from the property line and from any structure or building. You also need to evaluate how rainfall and drainage will affect your layout. 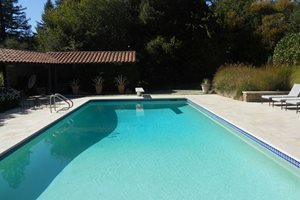 Be sure to include questions about these things with the pool contractor that you hire. 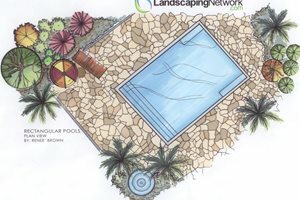 Use the following design tips for the most common swimming pool placement considerations. For small properties or large properties, there are certain key design details that can help guide your decision. 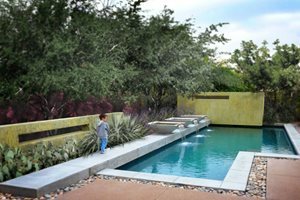 In small backyard spaces, a pool often must be located close to or adjoining the house itself. See how this pool was offset to the side to take advantage of full sun exposure, the view, and a diagonal yard space. 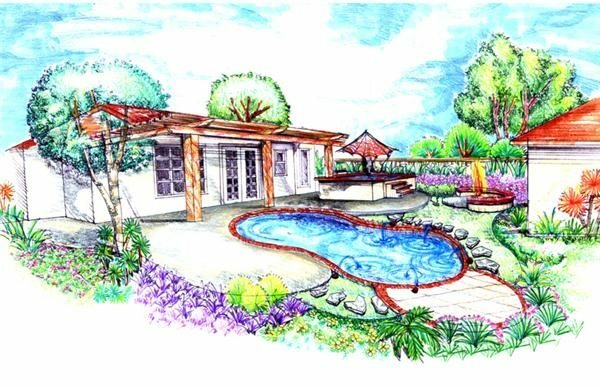 Pro Tip: "Almost no garden space is too small for a swimming pool, though it may take some engineering and design creativity to make it work."